This tutorial covers setting up Microsoft Visual C++ 2005 to work in Kernel Land. This will allow us to use, and completely work in, the nice MSVC++ 2005 IDE. We will be using the Express Edition. If you have the professional edition, some of the screen shots will be different. Do not worry as most of the options are still the same. This tutorial will also work fine if you have Visual C++ 2008 or Visual C++ 2010 (with some slight modifications in what options to set). Getting a high level language to work can be tricky to work and set up with. Getting the build envirement to work itself adds on even more complexity. The first problem, for example, is that MSVC++ only outputs Win32-compilent PE executables and DLL's. And, at our current stage, we only have a flat, pure binary program loaded at absolute address 1 MB. How do we execute a full blown C++ program, from our flat pure-assembler program? And yet, that is the beginning of the problems. C++ itself relies on the C++ runtime library. So? The C++ runtime library relies on the operating system. Because we are developing the operating system, C++ has no standard library to work with within our operating system. This means, that we have to work without any standard runtime. But wait! Remember that, in application software, the runtime needs to initialize everything for our C++ envirement (Such as executing global constructors, providing basic C++ operation support, and executing our main())? Because we have no runtime, we have to do everything ourselves. This produces an interesting chicken and egg scenario: How can we develop a runtime envirement without a runtime for it to work in? As you can probably see, it can be quite tricky to get C++ to even work properly. In this tutorial, we are going to set up MSVC++ 2005 for kernel development, and set up the language to work for us. We will also be watching for runtime integrations (i.e, watching where basic C++ relies on the runtime, so we can build our own). Please note, however, that some C++ features rely on details that we have yet to impliment. These details are fairly advanced. For example, the C++ new and delete operaters require that we have a working memory manager already. As such, this section cannot cover everything just yet. Nontheless, we will set as much things up as possible here. Just like almost any other project, creating a project is fairly straightfoward. Within the IDE, Select File->New->Project. 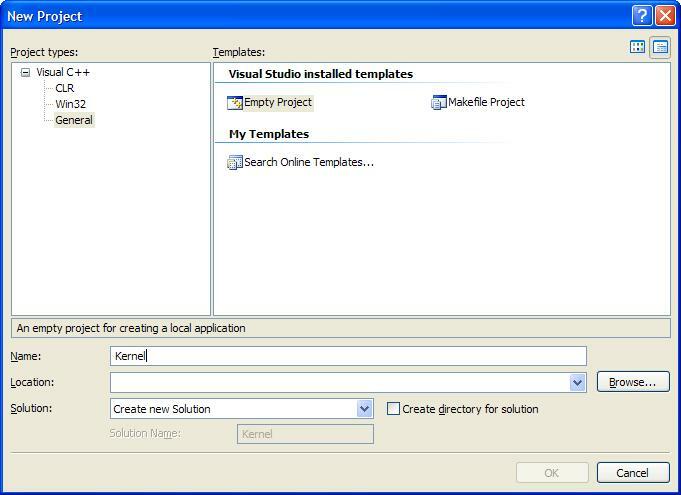 You should see a nice dialog: Notice that the Empty Project setting is selected under Installed Templates. Now, type in the name of the project, and choose the project location. When you are done, select the "OK" button, which should be highlighted. Your new project should now be created. This is great! The problem, however, is that the compilier assumes we are building a basic Win32 application. As such, it sets all of the project properties to it's default configuation, and links the Standard C++ Runtime libraries--which will not work for us. Because of this, we need to change the configuation settings. All of the configuation settings are discussed in the same format listed in the above picture (Please look at the left plane). Most configuation settings depend entirely on the envirement that is being built on. Remember that we are still in a very low level envirement. A Single wrong instruction produced by the compilier can make our code triple fault. Also, remember that We are still at Ring 0. As such, we still have control over every little thing. This is important, because if the code the compilier produces does not work with our current operating system setup, the code will triple fault. This is a problem. Alot of the configuation settings effect the output code. Weather these changes cause a triple fault, or work completely depends on the layout of your operating system, and its configuations. Alot of these changes do not need to be changed. However, because certain configuations may cause a triple fault, this indicates to be extra careful when trying to produce "The fastest and greatest code" from your C++ compilier. There are, however, some options that REQUIRE changing. These are the options that I will look at here. I will also cover some other options that one may find helpful. I will explain these specific options in depth. At the end of this section, I will post my current configuation, cool? This way, you can compare your configuations, and learn about setting up MSVC++ 2005. We are going to be building the kernel as an executable, so keep this as Application (.exe). This setting is located under General (Please see the image shown in the above section to locate Configuation Type). Looking at the above image again, you will see the C/C++ and Linker properties expanded. the C/C++ properties include General, Optomization, Preprocessor, Code Generation, etc. We will cover these properties here. None of these options we are not required to change. There are a couple of options I want to look at here, however. Although we are using MSVC++, we Cannot use it's debugging features. Debuggers require a runtime envirement to run in (and to hook) with an application. Because we do not have a runtime envirement, you should Disable this. Normally, Adding debuggng information will not cause any problems. However, because we are unable to use the debugger right now, there is no reason to generate debug info. Operating System code can get very complex. It is important that we can track even the slightest of potential problems. Because of this, I recommend to Set this to the highest level. This can be set to any option. If a specific setting causes the code to crash, disassemble the code and try to find out why. All source code in this series have been tested with all optomization levels to work. This is not required; but setting this option frees up ESP so we may use it. There are a few options that I want to go over. This requires runtime support, which we do not have. I plan on implimenting exception handling soon, though. Until then, this should be set to No. No changes needed here. I do personally recommend using __cdecl over __stdcall, as __cdecl seems to have a cleaner symbol names. It does not really matter though. Here is the command line that I am using. If you are having difficulty, feel free to use this as a refrence. You can also see all of these options set in the demo at the end of this chapter. /O2 /Oy /I "..\Include\\" /D "ARCH_X86" /X /FD /MT /Zp1 /GS- /GR- /FAs /Fa"Debug\\"
Compare this command line with the one you currently have. You may have additional options, depending on weather you decided to add more options. The linker produces a linker map with all of these symbolic names. This will be very important with debugging and testing. With this, there are some linker settings that are required, while others are optional. The optional settings may or may not work depending on your envirement settings and configuations. There are no options that require changing here. If you are using a real (or virtual) floppy drive, I personally recommend setting the Output File to point to the floppy drive. This way, the final binary will be placed into the floppy disk, allowing us to immediately test the Kernel in the emulator. By default, MSVC++ automatically links in a number of its libraries, including kernel32.lib, user32.lib, gdi32.lib, winspool.lib and more. Because we never use them, they will not cause any problems. They will add extra uneeded bloat to your kernel, though. Setting this to $(NOINHERIT) will fix this so they will not be linked. Set Map File Name to the name of the mapfile to generate. This value is stored within the program file. It tells the operating system how to run the application. Because this is a driver application, set this to Native (/SUBSYSTEM:NATIVE). This option insures to build this program as a kernel-level driver. This automatically envokes the /FIXED:NO option (instead of the standard /FIXED option), which generates a relocation section, instead of a fixed base address. Because we are developing a driver application, set this option to Driver (/DRIVER)). Setting Refrences to Eleminate unrefrenced data removes all unrefrenced symbols (such as varables and functions that are never used.) I recommend setting this option to reduce the number of symbols from the linker map, and to reduce kernel size. Setting Enable COMDAT folding to Remove redundent COMDATS will also reduce the size of the Kernel, and the number of redundent COMDATS. This should be set to the entry point of your kernel. In our system, this will be kernel_entry. This is the base address that the image will be loaded to. Remember that the kernel is loaded to 1MB? Because of this, this should be set to 0x100000. This will be automatically envoked by the linker. Set this to Generate a relocation section (/FIXED:NO). Add /ALIGN:512 to the Additional options text box. This is required to insure proper section alignment. Not doing so will cause problems executing the kernel or triple faults. Thats all! Compare your command line with the following. You may have additional options depending on your envirement setup. /NODEFAULTLIB /MAP:"Kernel.map" /SUBSYSTEM:NATIVE /DRIVER /OPT:REF /OPT:ICF /ENTRY:"kernel_entry"
I do not plan on going over the entire format of executable files here. Not until we cover program and task managers, anyways. The problem, however, is that MSVC++ can only output COFF and PE file formats. Because of this, we have to find a way of parsing it from within our Stage 2 bootloader. Because I do not plan on describing the PE format in detail yet, I will first describe its basic format, and how the code works. Lets take a look! Once we have loaded a file image into memory, it is simply a direct copy of the image file on disk. Because of this, in order to parse the file, all we need to do is read it from where we loaded it from memory. Understanding how to parse file formats are very important. Remember that the FIRST byte within the FIRST structure actually represents the FIRST byte from where it is loaded at in memory. This structure is the very first structure within the PE file. We do not need to fully understand this yet, until we create a full PE loader. For now, because we are only looking for the entry routine address, we need to find the entry routine address from the _IMAGE_FILE_HEADER structure, which contains the start of the PE header. Yey! Noe EBX contains the starting address of the _IMAGE_FILE_HEADER structure. This assumes our PE kernel image was loaded at IMAGE_PMODE_BASE. Okay then! Lets look back up at the PE file image structure again (The above picture.) Notice how a DOS stub program is right after the _IMAGE_DOS_HEADER. This is a useful program, actually. This is the program that displays "This program cannot be run in DOS Mode", if you try to execute a Windows program from within DOS. As long as myprog.exe is a 32 bit application, MSVC++ will embed that program as the DOS stub program, insead of the dull default one. Cool? This can be usefull for a verity of reasons. Who knows--Perhaps provide a specialized DOS version of your program? Because our kernel is an EXE file, it is possible for users to double-click and attempt to run it from Windows. Instead, this DOS stub program will run instead. Cool, huh? Anywhoo...Because the size of this program is not constant, we need to jump over it to the next section--the _IMAGE_FILE_HEADER. This is why we needed to get the location of _IMAGE_FILE_HEADER from the _IMAGE_DOS_HEADER struct. THIS is an important structure. While its name states that it is "optional"--It is not, so do not worry about that. It is a required structure for all PE programs. The important member here is AddressOfEntryPoint which contains...erm... The address of the entry point routine. For example...main(), mainCRTStartup(), whatever suits your needs. Knowing that EBX points to the beginning of this structure, all we now need to do is refrence EBX+AddressOfEntryPoint. Read from that location, and we have the beginning address of the starting routine to call. After we get this address, all we need to do is far jump to that location, and we effectivly call our C++ entry point! Now that everything is set up, lets try to put this all together. Because the image is loaded at PMODE_IMAGE_BASE, that is where the first byte of the first structure--_IMAGE_DOS_HEADER, is located. Remember that the e_lfanew member of the _DOS_IMAGE_FILE structure contains the address of the _IMAGE_FILE_HEADER. Because this is an offset address (Assuming base 0), we have to add the base address to where we loaded it in memory. Now EBX points to the beginning of _IMAGE_FILE_HEADER. The first lines jumps over this section (As we do not need it now). So, after the first instruction here, EBX now points to the beginning of the _IMAGE_OPTONAL_HEADER structure, where we can begin looking for the AddressOfEntryPoint member. This member is 16 bytes from the start, so we add 16 to EBX. Now, EBX contains the address of the entry point routine. Before calling it, however, we need to add the image base address to the entry point address. That is, the entry point address is just an offset. Not to hard, huh? Notice that we do not need to specify the code selector (0x8) here. The reason is that CS already contains 0x8. As you know, we cannot use the runtime that was provided with Windows. The reason is fairly simple. The C++ Windows runtime relies heavily on an existing Windows Operating system. Because we are developing a new operating system, this runtime is nonexistant. Because of this, We have to create our own C++ runtime code. This can get tricky. Alot of C++ features requires the use of a runtime. However, because we have disabled the runtime, the compilier will generate interesting errors when using these features. Other times are simply unpredictable, and may cause a triple fault. Lets look at this, for a moment. In applications, what calls main()? The runtime library. What calls and initialzes all global objects? The runtime library. What provides certain keyword supports that which tie with the system (such as new and delete)? The runtime library. What sets up the initil stack information? Again: The runtime library. Not defining a runtime library can cause unpredictable results. For one, global and static objects will never be initialized. Another problem is that the use of certain keywords are unpredictable. Global and static objects will never be deallocated. Also, the compilier relies on certain routines--useually defined by the standard runtime. Defining and calling virtual functions may become unpredictable. The calling of pure virtual routines will immediately crash. And, say goodby to new, delete, typeid, and exceptions. To make a story short: Creating a small C++ runtime is essental to get C++, the language itself, to even work properly for us. Now we can use the new and delete keywords without error--although they do absolutly nothing...yet, anyways. Pure virtual functions are functions declared in the class, but contain no definition. Their primary purpose is to force derived classes to overload that function. It is not possible to call a pure virtual function directly through normal means. Calling a pure virtual function will result into undefined behavior, because that function does not actually exist--It was never defined. If a pure virtual function has some how been called, the compilier attempts to use _purecall() as the call handler. If this does not exist, the result is unpredictable--That is, a triple fault. Normally you would want to assert () when this happens as it should never happen. There is nothing wrong with this...Just like with using the new and delete operators without them being defined. Simulariy, MSVC++ needs some routines defined for working with floating point math. I have defined other routines, which are _CIcos(), _CIsqrt(), and _CIsin(). Until we can verify these routines are needed, I will keep them inside of our runtime library. Everything is good so far, except what about globals? Remember that the runtime is responsible for executing all global executed routines and initializing all global and static objects? Because we have disabled the runtime, we have to do it. To do this, we have to watch exactally how MSVC++ handles the constructors (ctors). MSVC++ uses a special section (Simular to .data, .bss, .text, etc.) within the final binary image for ctors. When the MSVC++ compilier finds an object that must be executed by the startup code, it places a Dynamic initializer inside of this section. This means that -- for every dynamic initializer that needs to be executed at startup, they can all be found by looking inside of this special section. This section is the .CRT section. These dynamic initializers are a an array of 4 byte function pointers, which are stored within .CRT So, if we can find a way of parsing this section, we can call each function pointer that MSVC++ set for us to call each routine that needs to be called at startup. We cannot do this with C++ alone, however, as these section names are very MSVC++ specific. Also, as we are building without any runtime, the .CRT section is currently nonexistant. We have to add this section ourselves. The only way of doing this is using the preprocessor. Alright...This section can be a little confusing. The section names used in MSVC++ are very strange. Serously--.CRT$XCU? What were they thinking!? Actually, these section names do have a purpose. the section names are composed of two parts, seperated by the dollar sign "$". The first part is used as the base section name. The second part indicates where it is located at in the final image. The section name can be .code, .data, .bss, .CRT, or any other section name. The location_name is an alpabitic name that represents where we are in the section. For an example, in .CRT$XCA, .CRT is the section name, XCA is its location in that section. It does not matter what this location name is; the important thing to remember is that it is in alphabitical order. Notice the sections are arranged in the letters of the alphabit. The arrangement of the second part determins their location, at which they are stored within the final image. In the above, .CRT$XCA will be first, .CRT$XCU is second, .CRT$XCZ is the last one. We will be able to see these sections inside of the linker map, when we set them up. In order to create a new section, we need to use the #pragma data_seg() directive. This directive insures that all data allocated after it is placed within this new section. "section_class" is retained for compatibility purposes only, and is now ignored by MSVC++. By default, we are unable to read or write to the .CRT section. However, we can read and wite to the .data section just fine. What we want is the same permissions for both section names. We first typedef a function pointer to improve readability. This function pointer is used to point to each global initializer. *	MSVC++ creates dynamic initializers and deallocaters, which help us in calling the routines. The above code creates the .CRT$XCA section. By declaring this with an "A", we insure this will be right before the next .CRT section defined, so it is guaranteed to be right before our .CRT$XCU section. //! .CRT$XCU is located here. Our .CRT$XCU is giaranteed to be located before .CRT$XCZ and after .CRT$XCA because of the naming convention used. This is the .CRT$XCZ section. Again, because of naming conventions, it is guaranteed to be right after the initialzer list within .CRT$XCU. By defining a function pointer here, It is guaranteed to point to the last initializer routine - 1, within the initializer array within .CRT$XCU. __xc_z is the standard name used by the MSVC++ CRT. ...And merge the .CRT section with our .data section. This insures we can access the .CRT section from the .data section. To initialize each routine, just loop through each function pointer and call it. Warning: Beware of null function pointers. Calling a null function pointer will result into an invalid jump to some random location in memory, which will result in triple fault. Yippee! We now have all global initializer routines being executed. Whats next? Cleaning up after ourselves, of course. These are our function pointers that we use to keep track of where we are at in the global deinitializer array. We define where these arrays is located. MSVC++ adds deintializer code for each global object, that adds a function pointer to the global deinitializer array. It does this by calling a specially defined routine, atexit (). Note: MSVC++ requires this routine. Not defining this routine will result in errors when defining a dtor of any kind. There are alot of possibly new concepts for our readers, however, so all of this may be better in an example demo. We need to insure the registers and stack are setup before any code is executed. This is very important to insure we refrence the correct descriptors in the bootloaders' GDT. We also need to setup the stack, as C++ uses the stack reguarly. mov ax, 10h				// offset 0x10 in gdt for data selector, remember? Next, we store the current stack frame pointer. This will insure that any routines we call has a place to return to. Now, we call our main() routine! This demo loads and executes a 32 bit Kernel written in MSVC++ 2005. It also includes all of the source code in this tutorial, as well. Yey! Alot of concepts in this tutorial is farily simple, isn't it? We covered setting up MSVC++ 2005 so that we can use the compilier for use in operating system Kernels. We also looked at creating a basic C++ runtime envirement, ctor and dtor calling, virtual function handling, and global operators. In the next few tutorials, we are looking at creating envirements for different compiliers. This tutorial has covered setting up MSVC++ 2005.